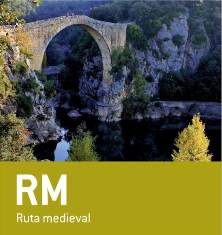 This medieval bridge was built in 1345–1346 and all goods and animals that crossed it were obliged to pay a toll. It was built by the Malart family, the Barons of the village of Sales, for commercial reasons. It provided access for the inhabitants of the farms and hamlets to the west of the river Llierca and its tributaries to the towns of Tortellà and Besalú. The bridge was on the old cart track that ran from Tortellà to Oix and such a strategic location meant that the Barons of Sales could charge traders and herders to cross. It consists of a single massive elegant arch, 19.10 metres in diameter, built from nummulitic limestone, that rests on two limestone outcrops rising 7–8 m above the level of the river. The paved section of the trail that crosses the bridge is 52.70-m long and 2.3-m wide within (3.10 m including the retaining walls). The Itinerànnia network of paths crosses the bridge, as does the GR-1 long-distance footpath.